Microsoft Game Studios | Things That Go [BLEEP]! 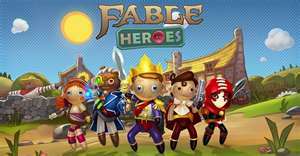 This week sees the release of the third Arcade NEXT games: Fable Heroes. Not only do we get that game this week, but we also get Awesomenauts as well, despite the financial trouble that the publisher, dtp, is having. It’s the year 3587; conflict spans the stars. Huge robot armies are locked in an enduring stalemate. In their bid for galactic conquest they call upon the most powerful group of mercenaries in the universe: the Awesomenauts! Play as one of several Awesomenauts and storm the online arenas alone or with friends. Each Awesomenaut can be upgraded with their own unique items to suit different strategies. Expect new items and Awesomenauts to be added regularly! You like Awesomenauts? Also check out TNT Racers and Crazy Machines Elements. This week sees another of the ARCADE NEXT titles released. From the looks of it, if you liked the style of Viking: Battle For Asgard you will probably like this one as well. A Sci-fi project featuring detailed, action-packed underwater combat which will introduce a new trend in the TPS genre. An Exciting game play that features the dynamic use of both environments for combats: land and underwater. An original multiplayer mode with underwater battles that offer the player a totally different and new experience! Players will descend the murky depths in pursuit of enemies armed with a selection of underwater equipment that range from a specialized suit with jet pack and integrated harpoon as well as other high tech equipment. With the majority of the game play taking place below the water’s surface, action-adventure fans will need to master new skills to fight hostile enemies and to infiltrate enemy bases. The story line takes place in the nearest future in a world of unsteadiness, chaos, espionage, terrorism and the desperate fight for world supremacy and possession of sophisticated biological weaponry. So will you be picking up either of these titles this week? Finish ‘The Ascent’ without faulting on the Rattler 125cc bike. Pass ‘Lab Rat’ without faulting while constantly on fire.